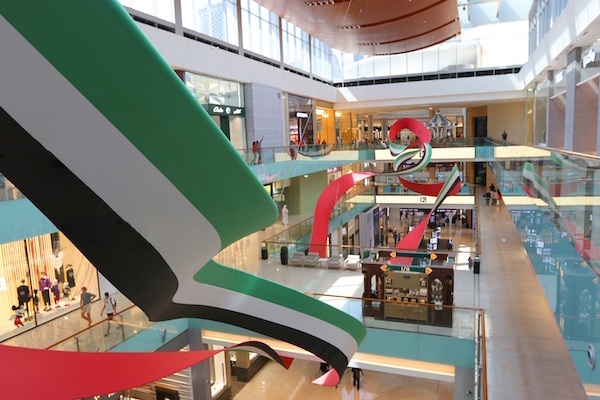 To mark UAE Flag Day, The Dubai Mall is unveiling an extraordinary 142m long art installation of the UAE Flag, honouring the nation’s past, present and future. The undulating design of the Flag is a must-see photo opportunity for guests and displayed high above for all to enjoy. ‘Floating Colors’ is an extensive sculpture that seemingly floats in the atrium of The Dubai Mall and spans the height of its three stories. The artwork is inspired by the flag of the United Arab Emirates and the band’s two sides together show the colors of the Emirates’ flag: while one side is completely red, the other side is green, white and black. The sculpture is reminiscent of a long ribbon undulating in the wind. Its three-dimensional sweeps and colorful appearance create an impression of lightness and joy and makes it a strong symbol of identity. The sculpture expands in the atrium’s void. The strong physical presence of the temporary art object brings to attention the physicality of this space and charges it with meaning. ‘Floating Colors’ was designed computationally. With its length of 142 metres and complex shape, the challenge lies in the sculpture’s unobtrusive suspension. The sculpture was assembled of 22 aluminium pieces covered by fabric. ART+COM Studios design and develop new media installations and spaces since 1988. The design company uses state-of-the-art technology as a medium of artistic expression and for the interactive communication of complex information.